Categories: Krishna, Krishna, Srimad Bhagavatam. Every incarnation taken by Bhagawan is to establish dharma – dharma samsthapanarthaya sambhavami yuge yuge. Rama and Krishna are called ‘poorna avatharams’ where Vishnu takes form directly and all the powers of God are fully manifested. Ekantha Bhakthas of Krishna (Devotees with one-pointed devotion) see the purpose Krishna avatharam solely as a way to enjoy his lilas, sing his divine name and glories, and be absorbed in his divine birth. It is this divine birth that we will be exploring today. 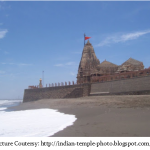 In the kingdom of Mathura, a grand wedding was taking place between Vasudeva and Devaki. 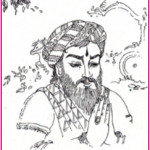 Devaki’s brother, Kamsa, took the newlyweds outside for a procession, and during which Kamsa heard a divine prophecy. The prophecy told Kamsa that the eighth child of Devaki and Vasudeva would kill him. Kamsa immediately tried to unsheathe his sword and kill Devaki, but Vasudeva vowed to him that he will give Kamsa all of his children if he spared Devaki’s life. Kamsa imprisoned the two of them and went on to kill their first six children. 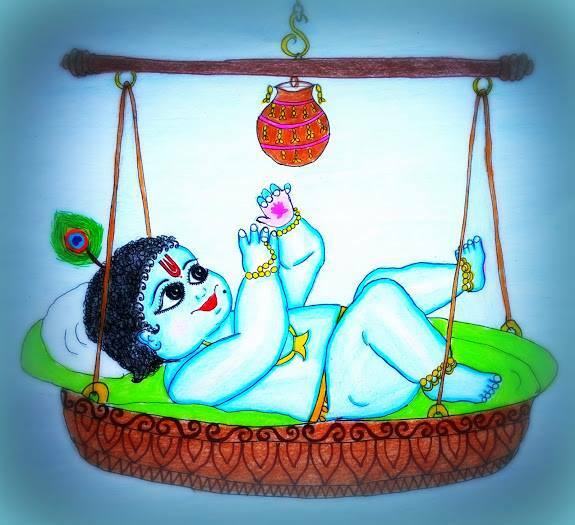 The seventh child who was Adi Sesha, was conceived but Bhagawan moved the child to Rohini’s womb with the help of Yoga Maya, and that child was eventually born and named Balarama. 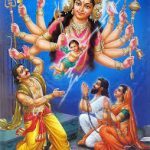 Once Devaki became pregnant with their eighth child, Vasudeva could see a noticeable change in her. She looked like she was glowing from within and was absolutely radiant. 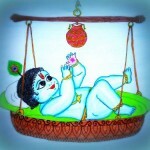 Lord Krishna was born at midnight on ashtami in the prison. Knowing that his parents won’t be able to provide him with toys because of their imprisonment, the Lord brought his own toys. He came adorned with beautiful ornaments and didn’t cry like a normal baby because he wanted to protect his parents from Kamsa. Krishna instructed Vasudeva to take him to Gokulam. There, he was to exchange Krishna with the baby girl born to Nandha Baba and Yashoda bring the little girl back to Mathura. As soon as Vasudeva lifted the baby Krishna into his arms, the chains around his legs immediately fell away and the prison doors opened. 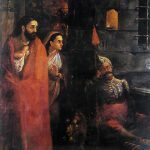 As Vasudeva left the prison cell, he saw that all the guards had fallen into a deep slumber. When Vasudeva walked outside, there was a torrential downpour. During his journey to Gokulam, Vasudeva had to cross river Yamuna. He held baby Krishna over his head and entered the waters. Yamuna Devi gave way for them and Adi Sesha offered protection and shelter for baby Krishna. Meanwhile, early that same morning, the residents of Gokulam all rejoiced over Krishna’s birth and admired his beauty. He went on to do many lilas over the years and eventually killed Kamsa. 2 Responses to "Birth of Krishna"
Very crisp narration, Sibiji! wonderful! Hope to see more of your writings. Amazing Write-up Sibi! I can see the pure devotion in your writing.